I knew all about this concept before I got to the show, including its problems. But after seeing it in person, I feel like Audi should reconsider its status. 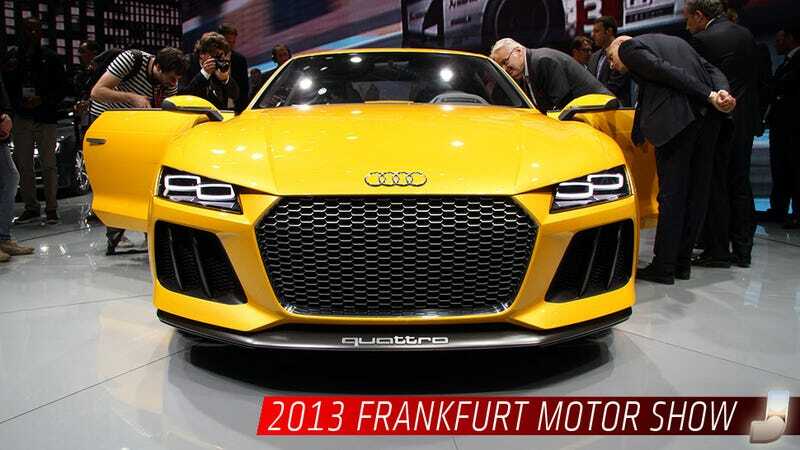 The Sport Quattro Concept is the other great car Audi is not going to build. It's a show car they only made to celebrate the 30th birthday of the original Sport Quattro. The roadgoing version of that car had 200 horsepower from a 2.1-liter inline-5. This has 700 thanks to a 4.0 TFSI V8 and an electric motor boosting torque by 295 lb-ft to a monstrous 590 lb-ft at full throttle. That equals 3.7 seconds to 60 mph and a top speed of 189 mph. But the electric system also makes it quite heavy at 4,078 lbs. That's not sporty at all. My problem is that it looks too good to be thrown away. The solution is a very simple one: ditch the electricity, leave it to the twin-turbo V8's 560 horses to do their job!